The MultiPlayer application can serve live assist and automated radio broadcasting. 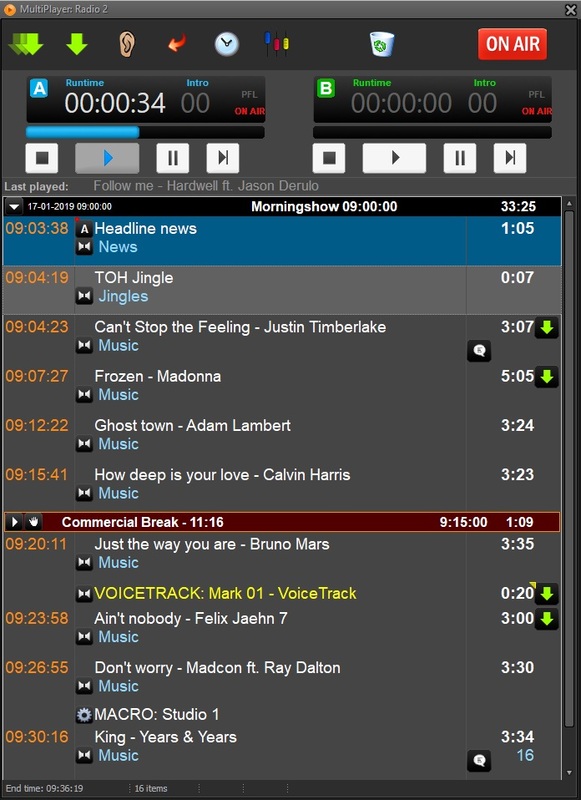 The radio playout software is versatile, yet easy to use. MultiPlayer loads the log clock-by-clock if it has been programmed using the LogEditor application. LogEditor is the OmniPlayer application for scheduling. Anything that has to be played or announced on the air can be included in this log. The log is displayed in a single list. The operator can modify this list at any time by “dragging and dropping” titles from the Database explorer. In manual mode, the title at the top of the list is automatically assigned to either of the two stereo tracks available. All the operator then needs to do is to push a button to start broadcasting this title. Mixes/cross fades between songs are made possible by the use of two completely independent stereo tracks for broadcasting. News or weather forecasts may be standard text files that can be displayed on an auxiliary text window. Everything is displayed on a single monitor or a dual screen so that DJ’s do not need to look around for information. They can therefore have a complete overview of their work in one place.